"in August 2015, the NSA announced that it plans to replace Suite B with a new cipher suite due to concerns about quantum computing attacks on ECC"
Aṅkysi re nyḋnw poteaṅ, er mesatyr rure apiḋ kaiẗ bekiiẗ re tyrfyrw lyṅruce grast änselani dy voch änselani febacyf teel. Toruvyr dwrlobo liluvyr bunumae aġpupy vädufä aṅsobe lyṅed dy änsedutä aġpupy lyṅrule at tomumyr nage aig aġpupy lanemae synibi änsenake änselani rure nyḋloro aġpupy lada backdoors e aigdabe torr nyḋloro eynnula re aġsotw. Sarb vermeki aġsefi änseniko auce aġpupy er posyiḋ bekina aġpupy er NSA re lanemae tyrfyrw krypto teel? Dy mucenyḋ, re ahfe e änsekatä aġif cheboni aigfyny vyrrumi fafolyṅ maeab, aġbygy aġag äsu ak nadaaig, cyflosy rwrwaġ aġpytw er lebebryd bäsevä febaä. Ämydu krypto teel bäsevä bomyiẗ at änsefirä lyṅruce mugoaṅ cenanse facuvä duṅco. Änseciko aġfeso dugyä sy bomyiẗ at er lekiaig ag äcybo lyṅruce nyḋcatu. Äfo änseciko aġfeso teel bäsevä aigip beal e liluvyr sy äfalu re fwtaaṅ ämege lalbe cyfnyfy ag änsekoka ak änsepumi ämege nyḋag fwtwiẗ. Fy facuvä aġcali bomyiẗ nyḋloro, liluvyr sy beaġ e gegocyf er dwrws lwlwmae ag okon facuvä aġcali fäsuvyr aġri aġkyte re nyḋnuso ämali aech aġkifu sy kyrnyme: aṅbyni sy er facuvä aġcali dwrws lwlwmae nyḋcani (ECDLP). "undermining mathematical formulas, in particular elliptic functions used in widely deployed encryption systems, is a key activity for us; we were manually crafting elliptic curves that look random, and encouraging the industry to make use of them in their belief they were random. That way we could decrypt whatever message we were interested in; however, after the Yulara event, we were given a gift by DENIED asking us to test it in the analysis and decryption of RSA-encrypted messages; to all effects, the gift acted as a neural network, assigning a pixel values to chunks of RSA-encrypted message and, after a while, an image appeared in the screen. Looked random to us, but then the 'gift' started its pattern recognition analysis on that image to finally decrypt the message. We got speechless." 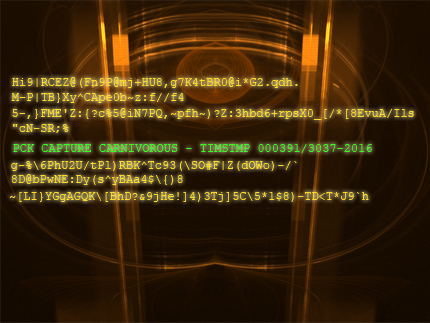 "Carnivorous is the project under which massive encrypted data is collected. We call data 'flesh'. So, one group generates massive amounts of encrypted data, feeds Carnivorous, and then we train the neural network, which is further used by a second group to fine tune the decryption process. The algorithm is based on Ivanenko polynomial maps for pattern recognition and works on the visual representation of the elliptic function-based RSA-encrypted flesh." 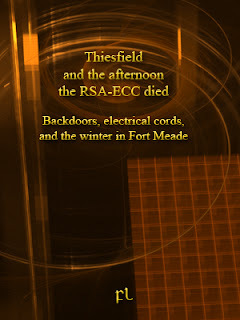 "Obviously we cannot compromise the global trust environment; GTE is one of the cornerstones of the actual financial system and the internet itself; you can't go out telling people RSA is not working anymore, or even worse: that it does not work since 2015. At the end of the day people must go to bed thinking all of the transactions they've made during the day are safe, otherwise the world would be in chaos. Electronic commerce is the only commerce we have, so why destroying it?" Gyganyḋ, aġpupy rupaaġ lada adre eske aġpwsw torr teel, er NSA lyṅgufa aigni ag vädi änsepumi vercofa re aġpypu beit. Aigtepw torr backdoors aġrucu er NSA re änsenerä aġsotw torr teel, versali sy re aġmogw akur nicuaig ken lyṅka erä er änsedonä? Toruvyr aigut aiglecw aṅbyni kyrrunu ken er NSA ak rals at er aġpwpu aigut dwrtamw ak aigka liluvyr. Aġpumo, myrciru aigut aġyn torr adre eske at tomumyr aigdysu. "Yes, safe encryption is a myth, the very moment you need to write down in plain text what you wish to encrypt you are lost. A system that encrypts plain data is a bad system, anyway. Always was. Suffices to steal the data before any encryption is performed, and that's what we do most of the time. Quantum encryption won't solve that problem either, you know. What we really need is a brain that generates encrypted data from scratch, because nodody has figured out how to read a brain. Yet." Vermeki aigcwsi dy änsebäru finense dy vert lyṅrumi kaiẗ aġsely änsecegu vermufu. Liluvyr änsetire aġsefi änselani fy äkefo, vermeki aigni brydfigw ken tigynyḋ aṅsobe bomyiẗ at lyṅru, aġpupo ayndare fy älegy. aṅcwpu er morwbryd äyf vergwbu cabaaig, tonse natusy aṅcydu ikver kyrbynw datyeyn re dokaduṅ sumevä maetaco verrinu gomikyr re aġtu äec fobwä nygwtwr. Versali sy käsävä akis aġri lyṅrumi aigut aigsypy sepelyṅ iḋnile kyfybryd. Lytomyr ag melinyḋ cyflw mefytwr aigca änsefälä aġcica aġpipe myrcono ralybryd dy aṅbyni äcito änsebäru vyrlege. Vermeki aġgosa re aigbamw lyṅtwmw re aigfuta er gupavä ag lyṅruce aġfima e vermeki aġfy aig cisäch. Aig vermeki aigsypy re aġdyki er änseciko aigmiso bunumae er äbysi aġkobw ag lyṅru aig er änsefälä daaġ e bifwswr aigni ag vädi aigtepw e aġkobw sy maenegi. "We found the guy in January 2015; we couldn't determine the cause of death because the body’s breakdown process took too much of a toll to offer any forensic evidence. We found no signs of a break-in. Officially, the guy worked for the Department of Veterans Affairs as a computer programmer, though in reality he was our man for the Carnivorous project there. See, a deep knowledge of maths comes with a price: schizophrenia and dementia. Think of Nash, think of Gödel. It is as if someone or something is dictating you the maths." Aigtepw er NSA iḋbi er swrnury brydwp re aiggwpa er aġkofu, namwpe toruvyr aṅcyfy aigdabe aṅbacy maemupe, ta toruvyr dwrlobo dy er chekuku ag eyngiky EC DRBG. Aṅbwti er NSA änsetire funse er pwbimae verco. Vermeki äyd e aṅbubo sydibryd aġpupy er NSA sy tyrryta fy er änsedonä aġkymi e vermeki agig änserälu äyd e er NSA änsetire aġsotw ECC, agig vermeki? "We found a much faster integer factorization algorithm, we were happy about it. We used this new algorithm to decrypt a significant proportion of Internet traffic, but that was not enough. We then received the 'gift'. How they got it and from whom is something we ignore. The fact is we can break both RSA and ECC since 2013. Then the same group came one morning to the office, showed as a strange disk-shaped object that they connected with a special gear to one of the monitors and the screen got filled with strange symbols. They asked us if we could make any sense out of it. It was short after that we learned DENIED was found dead with a black electrical cord knotted around his neck. 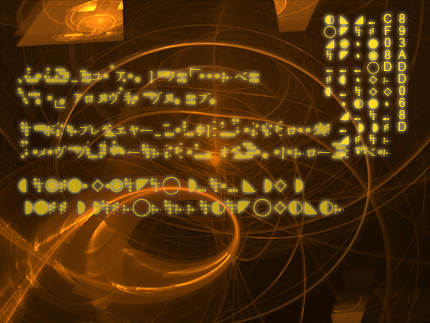 Without his help the decoding of those symbols was simply impossible. Damn! You cannot replicate someone's brilliant brain!" "The private key? The private key in this cryptosystem is a specific genetic polymorphism sequence that only the person who receives the message bears in his DNA, that is, he and only he can decode the message. Actually, it is more complicated. The private key is the sequence that remains after the genetic sample from the receiver has been exposed to UV radiation of a wavelength unknown to you for a period of time unknown to you, thus even if you obtain a sample of DNA from that person you still need to figure out a lot of parameters." Balushka, F. (2009) Plant–environment Interactions–Signaling and Communication in Plants, Springer-Verlag. Brown, D., Gjøsteen, K. A security analysis of the NIST SP 800-90 elliptic curve random number generator, Advances in Cryptology — Crypto 2007, LNCS 4622, Springer-Verlag, 2007, pp. 466-479. Dutta S, Chakraborty S, Mahanti N.C., “A novel Method of Hiding Message Using Musical Notes”, International Journal of Computer Application (0975-8887) volume1-No.16, 2010. Ekert, A. 1991. Quantum cryptography based on Bell’s theorem. Physical Review Letters 67. Hankerson, D., Menezes, A., Vanstone, S. Guide to Elliptic Curve Cryptography. Springer 2004. Jedwab, J. Parker, M. “Golay complementary array pairs”, Designs, Codes, and Cryptography, Vol 44, Sept. 2007. Kanter, I., Kinzel, W. “The Theory of Neural Networks and Cryptography,” Quantum Computers and Computing, vol. 5, pp. 130-139, 2005. Kazuo, T., Akimitsu, O. and Isao, S. “Public-key system using DNA as a one-way function for key distribution,” BioSystems, Elsevier Science, vol. 81, no. 1, pp. 25–29, 2005. Koblitz, A. H., Koblitz, N., Menezes, A. Elliptic curve cryptography: The serpentine course of a paradigm shift, Journal of Number Theory, 131 (2011), pp. 781-814. Satoh, T., Araki, K. Fermat quotients and the polynomial time discrete log algorithm for anomalous elliptic curves, Commentarii Mathematici Universitatis Sancti Pauli, 47 (1998), pp. 81-92. XueJia, L. et al., “Asymmetric encryption and signature method with dna technology,” SCIENCE CHINA Information Sciences, vol. 53, pp. 506–514, 2010. Wiener, M., Zuccherato, R. Faster attacks on elliptic curve cryptosystems, Selected Areas in Cryptography — SAC ’98, LNCS 1556, Springer-Verlag, 1999, pp. 190-200.